Database Activity Monitoring (DAM) is widely recognized as an important enterprise technology, because it provides specialized event collection and analysis capabilities for security management and reporting (see "Ten Database Activities Enterprises Need to Monitor"). The most compelling drivers of DAM adoption are compliance-oriented. They include the need to protect data regulated by the Sarbanes-Oxley Act and the Health Insurance Portability and Accountability Act (HIPAA) in the U.S.; the requirements of data-centric global regulatory frameworks, such as the Payment Card Industry Data Security Standard (PCI-DSS); and data breach notification requirements in the U.S. and the European Union. 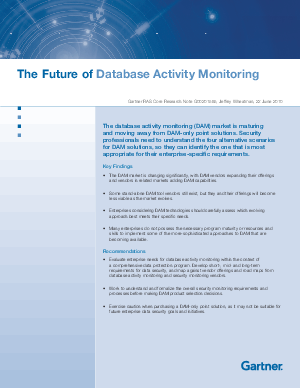 The database activity monitoring (DAM) market is maturing and moving away from DAM-only point solutions. Security professionals need to understand the four alternative scenarios for DAM solutions, so they can identify the one that is most appropriate for their enterprise-specific requirements. Key Findings: The DAM market is changing significantly, with DAM vendors expanding their offerings and vendors in related markets adding DAM capabilities. Some stand-alone DAM tool vendors still exist, but they and their offerings will become less viable as the market evolves. Enterprises considering DAM technologies should carefully assess which evolving approach best meets their specific needs. Many enterprises do not possess the necessary program maturity or resources and skills to implement some of the more-sophisticated approaches to DAM that are becoming available. Recommendations --- Evaluate enterprise needs for database activity monitoring within the context of a comprehensive data protection program. Develop short-, mid- and long-term requirements for data security, and map against vendor offerings and road maps from database activity monitoring and security monitoring vendors. Work to understand and formalize the overall security monitoring requirements and processes before making DAM product selection decisions. Exercise caution when purchasing a DAM-only point solution, as it may not be suitable for future enterprise data security goals and initiatives. Get a clear understanding of the ways DAM technology is being consolidated and integrated enabling security professionals and database managers to make strategic and tactical deployment decisions more effectively.